Otoplasty or ear reshaping surgery has been done for over a century. The most reason it is performed in children or in adults is for ears that stick out. (protruding ears) The operation primarily consists of reshaping the ear cartilages by the placement of sutures on the backside of the ear. Such an operation is always done in the supine or face up position. The patient’s head is turned side to side where the back of the ears can be visualized. 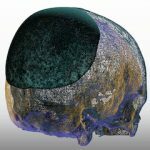 When assessing the reshaping of the ears in surgery a frontal visualization is done to avoid over- or undercorrection. In rare cases of combined occipital skull and ear reshaping surgery, the patient is in the prone or face down position. When prone a setback otoplasty can be performed from this position. In some ways it is easier than in the supine position because the back of the ear is more visible. 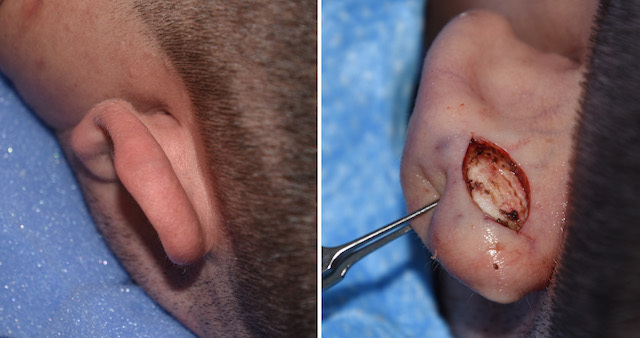 This is seen in this example of a more limited otoplasty where only the top of the ear needs to be set back only. Where the potential ‘disadvantage’ from the prone position is that a frontal visualization of the ear can not be done. But this is only an apparent disadvantage because one is used to seeing the ear from the front and not the back. Either way the ear looks the same from the side view. With experience one can learn to see the ear shape just as well. And from the back the depth of the auriculocephalic angle can even be better appreciated. 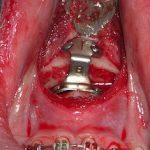 An experienced otoplasty surgeon should be able to perform an otoplasty whether it is in the prone or supine position. It is all a matter of seeing the ear shape in 3D from any angle.